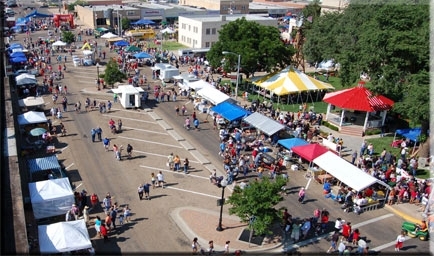 Every second Saturday in July, one of the biggest events on the South Plains is held in Levelland. Celebrate the city's rich heritage with good food, music, fellowship, arts, crafts and a parade. Early Settlers Day is a time to pay tribute to those who first settled in the area as musicians and vendors surround the downtown square and county courthouse to have a good time and honor the pioneers of the past. Early Settlers Day includes numerous food festivals, over 90 trade booths and a large music stage. Each year brings a new theme but the same old good times. Help celebrate with the early settlers of the past and the pioneers of the future. Some of this year's activities include: Turtle Race, Stick Horse Race, Pancake Breakfast, Dog Show, 4-H Project, Horseshoe/Washer Pitch, Ferris Wheel, Kiddie Train Rides, Rock-Wall Climb, Street Dance, Pony Rides, Water Slides, Antique Tractor Display.